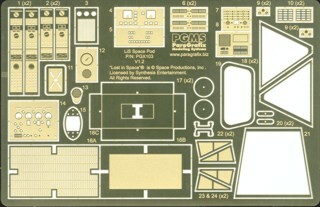 Enhance your Moebius Models' 1:24 scale Lost in Space Space Pod with this etched brass upgrade set. Special thanks for Dave Prosser and Amazing Figure Modeler magazine for allowing us to use showcase Dave's buildup in the photographs at the bottom of this page. See the review by John Lester at Starship Modeler.